Bangladesh Air Force, Bangladesh Army Armed Forces Akash Wars The basic responsibility of the Air Force is to protect the sovereignty of the sky line of Bangladesh. Besides, providing aerial support to the Bangladesh Army and Bangladesh Navy is also one of the responsibilities of Air Force. 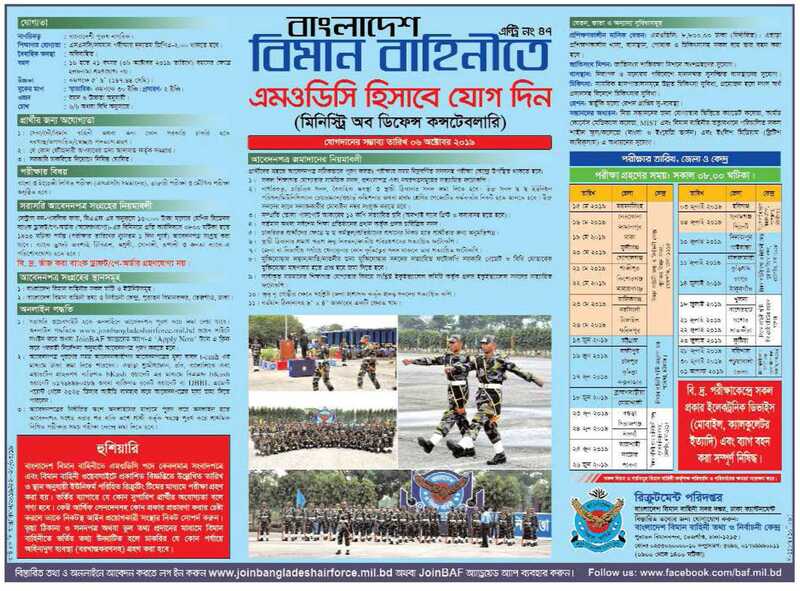 The new recruitment notice was published in Bangladesh Air Force. The official Bangladesh Air Force Authority published this government service. The new recruitment notice of Air Force Authority is published first in our Bengali cyber. So keep an eye on this same post to see the appointment notice of the Bangladesh Air Force. The appointment notice is published according to the Civil Rule, so the appointment notice goes through some rules, because the appointment notice is published in the form of picture or pdf form. New recruitment notices in Bangladesh Air Force are published in online magazines, Bangladesh e papers or their web portal. Which we gather together in front of the expectations. Please see the picture below for more information about the applicants. Training will be done for the post of MODC in Bangladesh Air Force. Educational qualification: SSC / equivalent examination will be required to have minimum GPA of 2.00 in any branch. Age: 06 October 2011 will be 16 to 21 years. Application process: The applicant must apply through the www.joinbangladeshairforce.mil.bd website or joinBAF android app. The test will start on May 15, 2015 and ends on 01 August. Check the ad to know about the date and center of the district according to the district.